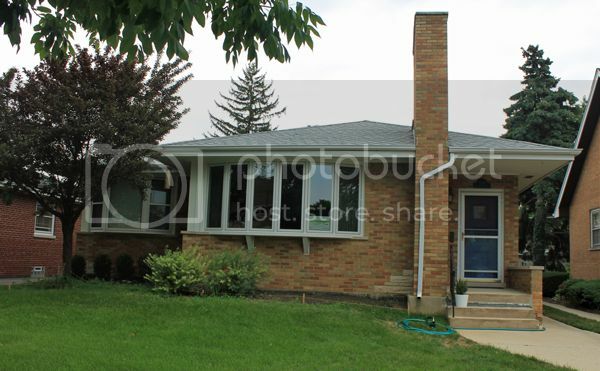 This is the front of our house. We had/have big plans for improving the front landscape, but unfortunately nature has had other plans. It is so gross hot and humid and disgusting, we're having a difficult time finding nice enough weather to go out and actually do it. Also, we're in the process of having our chimney partially taken down/rebuilt (you can't see how bad it is in this shot) and the mason told us to hold off on any front yard plans until after they're finished. And so we wait. Here's another shot of the house with my lovely drawn-in hot pink wall. 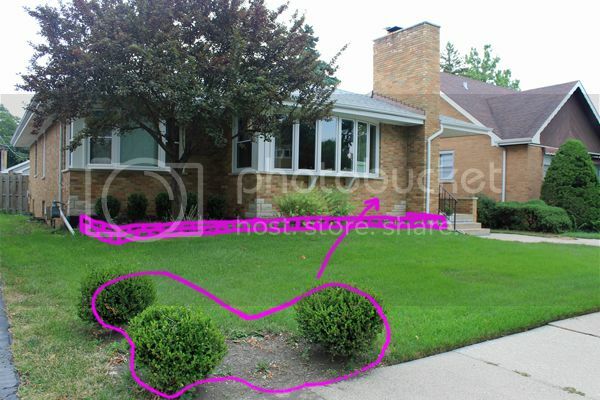 Also, I've circled the trio of bushes which will be transplanted up front. I loathe this triangle of bushes. There used to be more plants (I think some lavender?) in the middle, and all it did was serve as a trash bin for the local kids as they walked by. How rude! One thing that we HAVE actually achieved this summer is a small wall/edging around our front tree in the parkway. I like the square shape because it's unconventional (people around here usually mulch or have some kind of circular edging, if anything at all) and Todd likes it because he said it's easy to mow around. This only took us a couple of hours one afternoon, and yes, it was still really hot, but at least we were under the shade of the tree! I'd like to do a similar square box around our backyard tree (shown below). 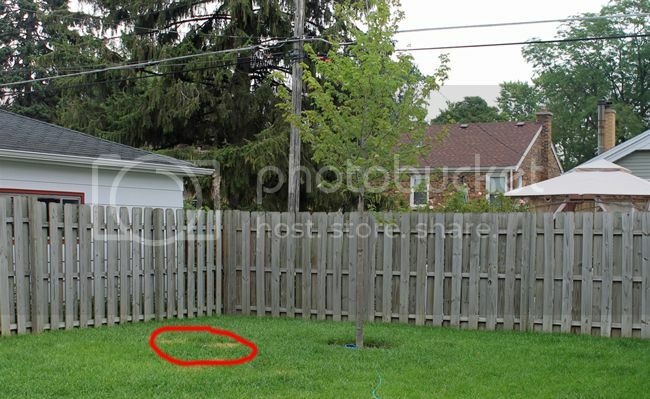 The red circle represents where we used to have a huge beautiful maple tree that died this last year! Our landscaper said it was the victim of beetles. So we had to have it removed, and we replanted a new tree slightly over from the original. It's a fairly large replacement, but nowhere near the size of our previous tree. Sad! Our chimney should be repaired within this next month, so we're hoping to still achieve our landscaping dreams this year before winter. Hopefully, the fall will bring us some nicer weather in which to work. We have a couple of friends willing to come over and help us with the front, so things should go pretty smoothly, and I'll be sure to share the completed project! Are you as bummed out about the hot weather this year as I am? Were you able to get any outdoor projects done? Or are you waiting like me? i like your ideas,and give you credit for even getting the tree edge done, but the making it easier for mowing makes a lot of sense, besides the fact that it looks good. At first when I saw this pic on fb it was really little and I thought you had some hot pink flowers growing, which is why I clicked, I love pink flowers. Anyway, yeah, I cant stand this muggy heat,especially since I just got my electric bill and now we cant turn it on cuz it was way too expensive. bummer. One of the things that I'm most looking forward to about getting the front yard done is that I can finally plant flowers each year! I don't know if I'll go hot pink, but I'm already toying around with some ideas in my head (yep, for next year... already) and hopefully the weather won't be as bad as it was this time around! 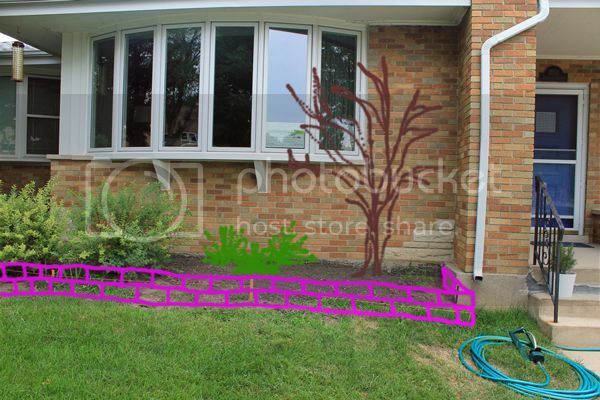 I like that concept on the garden wall. Plus pink color really looks so cute. This is the kind of Home Plans that I really like.